Last chance to get discounted Funk and Lunch tickets! After the show and lunch you’re welcome to visit the Holiday Bazaar until 2pm in the Parish Hall upstairs to purchase cookies, make an ornament, and search for treasures. 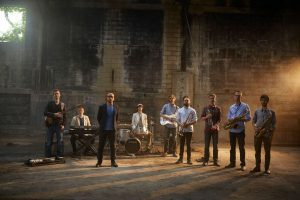 Chicago’s popular indie-funk band and SXSW performer returns with a 7 piece band for a special Sunday morning benefit concert of soul in Claremont. Bassel & The Supernaturals is an eclectic ensemble based in Chicago, IL led by the soulful vocals of Syrian-American songwriter Bassel Almadani. Their music combines soul, jazz, and funk with captivating lyrics about love, loss, corporate life, and a war in Syria that has directly affected Bassel’s family along with over 10,000,000 others. In addition to their invigorating live performances across the country, Bassel offers humanitarian seminars in regards to Syria and current issues facing Arabs & Muslims in the US.